This kidney bean shaped executive desk does not have conventional corners or corresponding parallel planes. However, it is symmetrical in it’s layout and function. The large, vertical and coved mahogany planks render a sculpted curved facade with open bookcases on each end. The desk has a standard compliment of drawers. The credenza end panels are also coved mahogany planks. 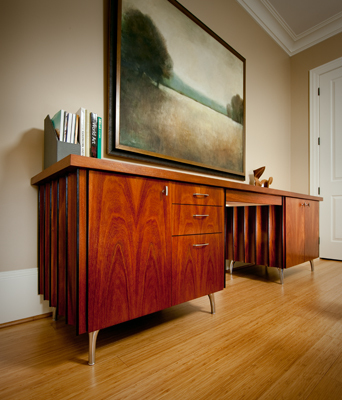 The credenza has drawers and general storage areas behind doors.